Today, more than 100,000 Jews live in Germany, making it the eighth largest Jewish community in the world. Evidence of Jews in the area now known as Germany dates back to the early 4th century; in the 1930s, a Jewish graveyard from that era was found in the city of Cologne. When the first Jews migrated to the “barbarian lands,” Christianity had not yet arrived in Western Europe, and the Roman Empire was still the continent’s dominant power. Little is known about the early German Jews, but by the 8th century, Jews were flourishing among the German tribes along the banks of the Rhine. The Jews, for the most part, lived in harmony with their newly Christian neighbors. Jews could hold public office, own land, and work in whatever industries they chose; they spoke the same languages and often had the same names as the Germans. Many Germans even converted to Judaism. That is not to say that life in Germany was stable. Like all countries at this point, there was no unified German state. Early on, Germany had consisted of a number of tribes, often vying with one another for territorial control. Later the tribes joined into a loose confederation, which resulted in a semi-autonomous “Kingdom of Germany.” Nonetheless, frequent civil wars and bids for power quickly destroyed any semblance of national unity. After Charlemagne united much of western Europe in the eighth century, Germany was a part of the Holy Roman Empire, which itself fell victim to occasional civil wars and fragmentation after Charlemagne’s death. The turmoil of the frequent wars and political disputes among the Empire, Kingship and various feudal estates was compounded by the emergence of the Roman Catholic Church as a force. The Church had, by this point, codified much of its doctrine, including the attitude that the Jews were a rejected people, who must be separated decisively from the Christians. Appeals from the Church to the Christian world to shun the Jews economically and socially date back to the Theodosian Code of the fifth century, and were periodically reissued by Church synods. In Germany, however, the Church’s efforts to prejudice the Christian rulers and people against the Jews largely failed in this era – people were too concerned about the political fluctuations, and simply surviving in the harsh frontier conditions, to heed the call to discriminate. The “Golden Age” that resulted for European Jews was interrupted occasionally by anti-Semitism, but, for the most part, Jews lived happily. In the tenth century, European Jewry’s most important intellectual movement began to thrive when Rabbenu Gershom ben Judah (960-1028) founded a yeshiva in Mainz, Germany. Gershom’s school attracted Jews from all over Europe, including the famous Rashi; Gershom became so renowned for his genius and prominence that he posthumously acquired the moniker “light of the exile.” Study of the Talmud increased, and the German yeshivas in Mainz and Worms came to overshadow those in Persia, the previous center of Jewish intellectualism. The Golden Age ended for the Jews of Western Europe on November 26, 1095. In Clermont, France, Pope Urban II made a public appeal to the Christians of Europe to liberate the city of Jerusalem from the Muslim Turks, who had closed it to pilgrims. This appeal marked the inception of the First Crusade. One result of the Crusade, whether intended or otherwise, was that the era of cooperation between Christians and Jews immediately ceased. With Christendom unified in a single purpose, the Jews were now viewed as outsiders, and were rumored to be allied with the Muslims. Crusaders would routinely massacre whole Jewish communities on their way to the Holy Land. Communities in Worms, Mainz and Cologne were devastated; in Mainz, for example, 1,100 Jews were killed in one day in 1096, and the synagogue and other communities buildings were razed. It is important to note that while the Pope occasionally condemned these attacks on Jews, the condemnations were neither vocal nor frequent. Moreover, the lack of any punishment or reprisals against the violators of the Pope’s orders gave the rioters implicit approval, and the attacks continued during the next seven crusades in the 12th and 13th centuries. While none of these future Crusades were as devastating to the German Jews as the first, which caught them unaware, their lives and communities were nonetheless changed irrevocably. Jews ceased to be exclusively a merchant class; much of Europe was now accessible after having been traversed by Crusaders, and international trade could be performed by non-Jews. Instead, in line with the Jew’s newfound subjugation at the hands of the Church, Jews became known as moneylenders. Because Christians could not lend money at interest, Jews had a niche waiting for them. Of course, such a profession did little to endear the Jews to their neighbors, some of whom would just as soon kill the moneylender as repay his loan. The collective isolation of the Jews also led to the rise of Yiddish. The Jews continued speaking a medieval dialect of German, even as the language was advancing and changing in the outside world. The language gradually incorporated elements of Hebrew, and eventually became a language unto itself, which was often incomprehensible to the non-Jewish Germans. The centuries that followed the Crusades were difficult ones for the Jews of Western Europe. In the thirteenth century, the Catholic Church instituted the Inquisition. Secular and religious rulers alike attacked “heretics” – a category that sometimes included Jews – with savagery, subjecting them to imprisonment, forced conversion and often death. At the same time, the Jews were accused of killing children for ritual purposes (blood libels), of host desecration, and, during the Black Plague in the fourteenth century, of poisoning wells. These accusations, and the violence that followed them (Juddenschlacht, or “Jews slaughter”), led to the repeated expulsion of the Jews of Germany from their towns. The evictions continued through the Middle Ages and the Reformation, and were the result of the uncertain status of Jews as citizens of the cities they lived in. Within each German city, the ruler granted the Jews a certain number of rights in a charter. This charter set the taxes that the Jews would pay, outlined the area of the city they could live in, and guaranteed them protection; the remainder of the laws were left in the hands of the kehilla. In essence, the Jews agreed to become the property of whichever ruler granted them a protective charter. This agreement occurred on the largest scale in 1236, when Emperor Frederick II issued the Servi Camerae Nostrae (“Servants of the Treasury”), which formally made the Jews the property of the empire. Implicit in the charter agreements was the fact that the charter could be rescinded whenever the ruler of the region wished – and the regional rulers frequently did so. Nonetheless, the Jews never fully abandoned Germany. Even when a city-state expelled the Jewish population, the disunified character of Germany ensured that another autonomous city would extend them a charter. Their reason for doing so was generally economic – the Jews could be counted on to fill the role of moneylender, and, despite the gains made by Christians in international trade, Jews were still considered excellent merchants. The Jews would thus settle in a new location; eventually, the economic role they served would become unnecessary, as Christians began to be crowded out of their industries. When this happened, violence against the Jews inevitably ensued, and expulsion followed. In this way, the Jews were constantly wandering through Europe, residing in each city only temporarily. In general, they moved east. As a result, by the late fifteenth century, the center of world Jewry had moved from Western Europe to Eastern Europe, with Jews especially concentrated in Poland. One positive result of the Jews’ new economic station was the rise of the court Jew. Because Jews controlled the loan of money, the feudal lords in Germany, and elsewhere in Europe, became dependent on the more prominent Jews for funds. Often, the Jewish advisors were single-handedly responsible for helping a Lord to raise an army, build a palace or furnish some public facility. These advisors were sometimes able to help a community escape a riot or an expulsion. For example, Joseph Oppenheimer (1699-1739), one of the most prominent court Jews in Germany, used his position to convince the duke of Wurttemberg to rescind an expulsion order that had barred Jews from living in his duchy in the south of Germany. In general, the Jews migrated within Germany in the Middle Ages from the towns on the Rhine in the south to the east and the north. By the thirteenth century, communities were forming in Munich, Vienna and Berlin, which would become important Jewish cities in Germany in the modern era. In the Reformation period, Jews continued to be oppressed both physically and economically – those who were not expelled shouldered a crippling tax burden. Additionally, Martin Luther, after failing to convert the Jews to Protestantism, savagely denounced them, which led to more religiously-inspired violence against them. The status of the Jews began to change in the seventeenth century, when absolutist (and later, enlightened absolutist) states became common. The rulers of these kingdoms viewed the interests of the state as supreme, and began to realize that the Jews were a valuable commodity that was wasted when expelled. The rulers of Prussia, Hamburg, Bradenburg and Pomerania, to name just a few, therefore welcomed Jews into their territories; however, the invitation came with numerous strings attached. The life of the Jews was highly regulated to ensure that the state extracted as much value as possible from them; laws were issued addressing employment, family life, residency and communal affairs. The expulsions that the Jews had become accustomed to became increasingly rare as this era progressed. The readmission of the Jews to many German states continued in the eighteenth century, when the charters extended to them granted them rights more and more similar to those of citizens. At the same time, however, the autonomy that had been a hallmark of Jewish communal life for centuries began to decline. As the Jews became more like citizens, their independent governance was withdrawn by the rulers. For example, when Frederick II revised the charter of the Jews of Prussia in 1750, he included strict rules regarding the workings of the kahal. The appearance soon afterward of the Haskalah, the Jewish reaction to the enlightenment, furthered the gradual dissolution of the Jewish semi-autonomy. Jewish thinkers and authors began to criticize the insularity of the Jewish community and to emphasize secular and worldly pursuits in place of the traditional Jewish lifestyle and religion. As a result, many Jews left the ghetto to pursue education (if and when a school would admit Jews), brought their disputes to secular as opposed to religious courts and befriended non-Jews. The most well-known example of this latter phenomena was the friendship of Moses Mendelsohn (1729-1786) and G.E. Lessing in Berlin. However, it was an atypical example, for while Mendelson remained scrupulously observant, most maskilim did not, which seriously eroded Jewish unity in Germany. The decline of the kahal continued in the aftermath of the French Revolution. When the leaders of the revolution declared, in 1789, that all the French would be granted “Liberty, Equality and Fraternity,” they included the Jews. Thus, the Jews became full citizens of France, a status that was later withdrawn, and then reinstated by Napoleon. This emancipation, along with the revolution against the British happening in the New World, set a precedent that began to be followed throughout Europe. Various cities and states granted the Jews full equality, or else instituted reforms that were meant to culminate in emancipation at a later date. In 1812, Prussia became the first German state to grant citizenship to its Jewish inhabitants, after years of lobbying by the maskil David Friedlander (1750-1834), Mendelsohn's protege. Soon, the kahal ceased to exist as an important institution; eventually, it ceased to exist at all. The new status of the Jews, however, was not achieved without opposition. In 1819, the masses gave vent to their frustration at the Jews’ rapid economic and political rise in the “Hep Hep” riots. Many peasants were less willing to let go of their conception of the Jews than the Jews were to let go of their conceptions of themselves. The new open, cosmopolitan atmosphere had its impact on religion as well. Frustrated with traditional observance, which they viewed as overly restrictive and irrelevant to modern life, many Jews joined the Reform movement. The first Reform Temple was founded in Hamburg in 1817, and it marked a dramatic departure from the traditional prayer service. Soon, Reform Temples opened elsewhere too, and Berlin became the center of the movement. Reform was opposed by the “Neo-orthodox” school, the brainchild of Samson Raphael Hirsch (1808-1888) of Frankfurt, which emphasized strict traditionalism combined with worldly pursuits. Meanwhile, in Breslau, Zecharias Frankel (1801-1875) laid the groundwork for the Conservative movement. The Jews of Germany were by now an overwhelmingly urban, professional class. Many of them took part in the German revolution of 1848, and in the resulting Frankfort parliament. The “Basic Laws of the German People” advanced by the parliament reinforced that Jews were citizens in full, regardless of their religious leanings. In the late nineteenth and early twentieth centuries, anti-Semitism became more visible, and even manifested itself in politics, but was dismissed by the urbane, assimilated Jews as merely a passing social phenomenon. The anti-Semitism became more pronounced in the aftermath of World War I in Weimar Germany. For the most part, however, the prosperity and legal equality of the Jews continued unabated until Hitler’s rise to power in 1933, and the legal discrimination and violence that ensued. Jewish social life in the inter-war period consisted of a struggle between Jewish nationalism and assimilationism. While many Jews tried as hard as they could to assimilate, and to distinguish themselves from their “Eastern” counterparts– i.e., the Jews in Eastern Europe who were still largely observant and traditional– others advocated a return to Jewish autonomy, either within Europe or in Palestine. The foremost proponent of Jewish autonomy was Theodor Herzl (1860-1904), the founder of political Zionism, who lived in Vienna. In terms of scholarship, German Jews enjoyed a “Jewish Renaissance” in the early twentieth century. 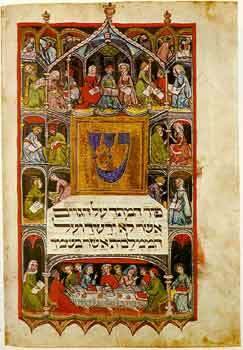 Many books and treatises were published, the Hebrew language was resurrected as a living language and Yiddish drama and newspapers flourished. Some Jews immigrated in this period, mostly to America or Palestine; many more did so after the Nazis began to persecute them. The majority of Jews, however, remained in Germany, with catastrophic results. The Nazi takeover of 1933, which resulted in Adolph Hitler (1889-1945), a virulent anti-Semite, becoming chancellor, was a stunning blow to German Jews. In 1935, the Nuremberg Laws were adopted; these laws officially defined Judaism in terms of race, and withdrew the citizenship of all Jews. The situation escalated in 1938 when Austria was annexed by Germany. 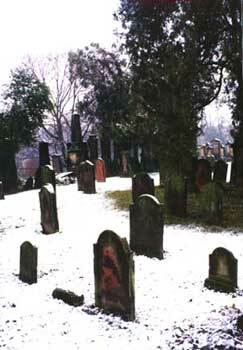 The atrocities perpetrated there against Jews soon became common in Germany proper as well. On November 9, 1938, Kristallnacht, Jewish businesses and synagogues were razed, and Jews were hurt and killed in rioting. The government persecution led to an increased solidarity among German Jewry. Communities banded together to promote immigration, and to provide many of the services that had been stripped away by the government. After the war began, these communal organizations were transformed into the Reichsvereinigung der Juden in Deutschland ( Reich Union of Jews in Germany ), headed by Leo Baeck. In March 1941, Hitler officially ordered the implementation of the “Final Solution,” which resulted in Jews being forced to wear a yellow star as identification, and being transferred en masse to ghettos and concentration and labor camps throughout Europe. The biggest of these camps was Auschwitz, located in Poland, where Jews were put to work as slave laborers, and eventually killed in gas chambers. The Reichsvereinigung was sometimes forced to assist the Germans in the implementation of the final solution. On May 19, 1943, Germany was declared Judenrein (“free of Jews”), though it is estimated that as many as 19,000 Jews remained in Germany underground. Following the Holocaust, Jews settled in Germany once again. The Jewish population consisted of three types: those who lived in Germany before the war and returned to their homes; displaced persons from elsewhere in Europe who took refuge in Germany; and those Germans who had never been discovered by the Nazis and had remained in Germany throughout World War II. About 1,500 Jews survived the Holocaust in hiding in Berlin. The total number barely reached five percent of the Jewish population before the war. This number decreased further as many German Jews immigrated to Israel in the 1950s. 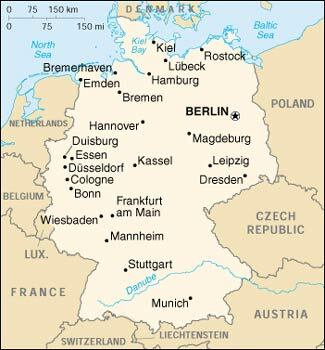 By the mid-1960s, communities were solidified in West Berlin, Munich, Frankfurt, Dusseldorf, Hamburg and Cologne consisting of about 20,000 Jews. Less than a thousand Jews lived in East Germany and those who did were concentrated in East Berlin. Other Jews unaffiliated with the established communities lived in Germany as well, but it is impossible to know precisely how many. For a long time, the communities were primarily elderly men and women, and opportunities for Jewish life were minimal: few communities conducted daily prayer services, only two Jewish schools existed, and the two Jewish weekly newspapers had only modest circulations. Intermarriage became rampant. Because of reparations paid to Holocaust survivors and their descendants by the German government, however, the communities in Germany were among the richest in the world. The reunification of Germany, which repatriated Jews in East and West Germany, also went a long way to increasing Jewish opportunities and unity in the country. The Holocaust destroyed Jewish rural life in Germany, and after the war very few Jewish individuals settled anywhere but major German cities. Beginning in the late 1980s and continuing through 2004, the long-stagnant communities began to change. Huge numbers of immigrants came from the former Soviet Union. The influx of Soviet Jews revitalized community life, kosher food and restaurants, and grass-root organizations. Germany’s open door policy also created problems and tensions with Israel. Nearly 250,000 ex-Soviet Jews applied for entry to the country, and approximately 190,000 were allowed in. More than half vanished after acquiring financial aid from the government and social support from Jewish agencies. Israel became concerned in 2004 when twice as many ex-Soviet Jews immigrated to Germany as went to Israel. After Israel complained, the Germans began to tighten the criteria for Jewish immigration from the former Soviet Union, insisting on an age limit of 45 and requiring the ability to speak, read, and write German. Today, the number of Jews in Germany is estimated to exceed 200,000, a number including non-affiliated Jews and decendents of mixed marriages. While the German Jewish communities have traditionally observant members, the population has become increasingly liberal; in 1995, the founding of the Association of Conservative and Reform Jews successfully challenged the einheitsgemeinde, the unified, traditional communities that had existed since the 1950s. Assimilation and intermarriage remain significant social problems. The Jewish Museum Berlin in the Kreuzberg district, a division of the Berlin museum, officially opened in 2001 and is notable both for its location and its contents. It is located on Lindenstrasse, and contains a myriad of Judaic items and artifacts, some more than 800 years old, and a stirring Holocaust exhibit. The museum also features the Libeskind Building, designed and built by architect Daniel Libeskind. His design was modeled after a deconstructed Magen David (Star of David), and in Fall 2007, Libeskind’s Glass Courtyard, based on a sukkah opened, whose roof spans the 7,000-square-foot inner courtyard of the Old Building. The Jewish Museum in Berlin stands to highlight the past and ongoing relationship between Germans and Jews in Germany. The architecture alone drew over 350,000 visitors to the building before the exhibits were even unveiled. The Chancellor of Germany signed an agreement with the Central Council of Jews in Germany on January 27, 2003, that officially raised the legal status of the Jewish community to the same level as the German Catholics and Protestants. This milestone took place on the anniversary of the liberation of Auschwitz and under this agreement the German government is obligated to provide support, services, and funding to the Jewish community and to nurture the existing German Jewish community. On November 9, 2006, the 68th anniversary of Kristallnacht (or “Night of Broken Glass”), Munich’s Jewish community celebrated the rededication of Munich’s main synagogue, which was destroyed on Hitler’s orders in 1938. The new synagogue and the accompanying Jewish community center opened to the public in 2007. Funding for the synagogue, which cost about $72 million, was provided by the city, the state of Bavaria, and Munich’s Jewish community. The synagogue, called Ohel Jakob, is built of glass and steel, and the base is made of a white stone similar to the Jerusalem stone of the Kotel, symbolizing the Temple. The top of the synagogue represents the tent that housed the tabernacle during the years of wandering in the desert. The building is located in St. Jakobs Square, only a few blocks from where the original synagogue stood. The museum and community center also house an elementary school, library and function halls. Between the community center and the synagogue, there is a memorial passageway. On one side, inscribed in layers of glass are 4,500 names of some of Munich’s Jews who were murdered in the Holocaust. A book accompanies the display, with photos and biographical information. Today, the Munich Jewish community has reached over 9,000 members, the same as before World War II. There are four synagogues in the city, including a separate liberal congregation with around 250 members. This growth is largely due to the influx of Jewish immigrants from the former Soviet Union in the 1990s. On September 15, 2006, The Adam Geiger College ordained the first rabbis trained in Germany since the country’s last seminary closed in 1942. The three men were trained for four years at the Potsdam school, which is affiliated with the World Union of Progressive Judaism. While Chabad has ordained Orthodox rabbis in Berlin since the Holocaust, none had received their training in Germany. There are 120 Jewish congregations in Germany, but only twenty have full-time rabbis. Two of the newly ordained Reform rabbis plan to stay in Germany. In March 2012, Peter Feldmann was elected as mayor of Frankfurt and became the first Jew to hold the position since the Holocaust. Feldmann, who ran as a member of the Social Democratic Party, ran on a platform that advocated social reform but also confirmed that he is a strong advocate of Israel's security and a supporter of Frankfurt-Tel Aviv relations. Frankfurt is Tel Aviv’s partner city, Feldmann said, adding “Israel and Frankfurt have good contacts,” citing the “regular school exchange programs.” The mayor-elect is an economist who has vast experience in the social service field, and has served as director of a senior citizen home and even volunteered in his youth on a kibbutz in Israel. Frankfurt previously had one Jewish mayor, Ludwig Landmann, who was in office for nine years until the Nazis came to power in 1933. 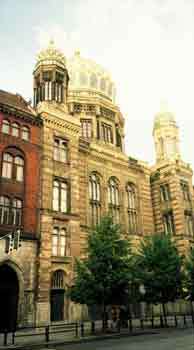 The "New Synagogue" on Oranienburger Strasse street in Central Berlin has been in operation since 1866. 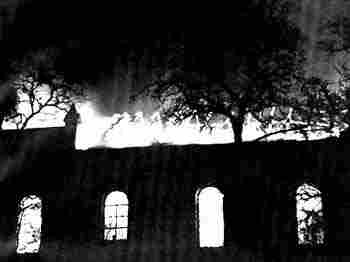 The synagogue was partially wrecked and badly damaged by fires on Kristalllnacht and completely demolished by bombing planes in 1945. After the destruction of World War 2 however the German government restored the synagogue and it now serves as not only a place of worship but also a memorial and museum to German Jewish life in the pre-World War 2 period. The building is also used as the office building for the Berlin Jewish Community. Currently Berlin houses the largest concentration of Jews in Germany, with about 50,000 Jews calling the city home in 2013. Holocaust memorial on the site of what was the Jewish cemetary in Berlin. In May 2005, the Memorial to the Murdered Jews of Europe, Germany's official Holocaust memorial museum, opened in the center of Berlin. The memorial consists of a Field of Stelae covering an area of 19,000 square meters and containing 2,711 concrete blocks together with an information center. The exhibition about the persecution and extermination of the European Jews and the historical crime sites was designed by Dagmar von Wilcken and attracts nearly half a million visitors each year. The German government and the Conference on Jewish Material Claims Against Germany announced an increase in funding for social welfare services for Holocaust survivors by $88 million on July 10, 2018. This funding increase will allow survivors to recieve more frequent and better quality home care, food support, transportation and medical services. This allocation makes Germany’s 2019 total pledge to the Claims Conference $564 million. At the end of 2018, Germany agreed to allocate $1.1 million for a new museum at the former Sobibor extermination camp in Poland. Throughout Germany there are large bronze plaques, artfully engraved with names and stories of individuals who perished at the hands of the Nazis. 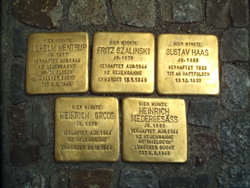 These are known as "Stolpersteine," literally translated to "stumbling blocks". These plaques are carved and engraved by hand by German artist Gunter Demnig who began the project in 1997. Each begins with the words "Here lived..." and they are funded by the city in which they are to be placed. They are embedded in the sidewalks outside of the last known residences of individuals and minorities who were persecuted during the Holocaust. The first small memorial, embedded in the sidewalk, appeared in Berlin’s Kruezberg district in 1996, and there are now more than 1,400 stumbling blocks throughout the capital. Not all communities have embraced these small memorials though, and towns such as Villingen have refused to allow these privately funded memorials to be displayed on public property. The town council has rejected proposals for the installation of the Stolpersteines in 2004 and again in 2013, and the 19 Stolpersteines that were created to commemorate the citizens of the village murdered during the Holocaust collect dust in the home of a local teacher. Throughout the post-war period, anti-Semitism has continued and neo-Nazi groups flourished throughout Germany. Hate crimes and membership in neo-Nazi groups has increased. In 2012, a study published by an independent committee of experts appointed by the Bundestag, the German parliament, found that anti-Semitism was on the rise in Germany, and not just from the neo-Nazi and Islamic fundamentalist parties. "Anti-Semitism in our society is based on widespread prejudices, cliches with deep roots and pure ignorance about everything to do with Jews and Judaism," wrote one of the report's authors, Dr. Peter Longerich. The study also criticized the way Germany deals with anti-Semitism. "There is no comprehensive strategy for fighting anti-Semitism in Germany," said another of the authors, Dr. Juliane Wetzel. But despite the grim situation in Germany, the report noted that anti-Semitism is much worse in many other European countries, including Poland, Hungary and Portugal. A Jewish individual was attacked in Berlin on November 25, 2014, while leaving a synagogue. He sustained a black eye and multiple fractured fingers during the attack, which was perpetrated by a man who spoke German with an Arabic accent. According to the victim there is no doubt that they were attacked because they looked like they were Jewish. Two Berlin-born Palestinian men were charged with planning attacks on the Israeli embassy and other Jewish institutions by a public prosecutor in Berlin, in December 2015. Mohamed El-Nand Ali El-I, both 21 years old, were charged with “planning a massive act of violence,” after their plans to bomb local synagogues and the Israeli embassy were reported to police. The men were arrested in July 2015, and the trial began on December 15, 2015. During the refugee crisis of 2015 spurred by civil war in Syria, the rise of the Islamic State, and general instability in the Middle East, Germany opened it's doors to refugees from the war-torn region. As Germany took in thousands upon thousands of these desperate refugees, the German Jewish community grew wary of a possible future rise in anti-Semitism in their country. The President of the Central Council of Jews in Germany, Josef Schuster, stated in a newspaper interview that intolerance and distaste for Israel and Jews is innate in much of the Middle East, and the rising immigrant population may lead to a rise in anti-Semitism in Germany as a whole. Schuster called for limiting the number of refugees allowed to enter the country in November 2015. The number of Germans who espouse extreme political views rose by 9% from 2016-2017, according to a survey by Germany’s security agency Verfassungsschutz. The survey concluded that the number of Germans who associate with far-right extremist political parties had increased by almost 1,000 during that time period, and that there were at least 600 active Neo-Nazis in Germany. While this data is alarming, the Verfassungsschutz also found that violent crimes motivated by racism experienced a 35% decline from 2016-2017. The government revealed that in 2018 anti-Semitic offenses rose about 10%. Physical attacks on Jews increased 60%. In an incident that went viral on the internet in early April 2018, 21-year old Israeli Adam Armoush attempted to prove to a friend that Berliners do not harbor anti-Semitic feelings by filming himself walking the streets of Berlin while wearing a yamurkle. While filming himself Armoush was assaulted on the streets by a Syrian refugee, who shouted anti-Semitic slurs and beat Armoush with a belt. In response, thousands of Germans of all faiths participated in a country-wide march against rising anti-Semitism on April 26, 2018. Marchers all wore kippot in solidarity with the German Jewish community. A Syrian Jewish man was assaulted by a group of young adults in a Berlin park on July 7, 2018, after the youths recognized that he was wearing a Jewish Star necklace. The man had asked members of the group of young people for a light for his cigarette prior to the attack. When one of the youths realized that the victim was wearing a Jewish Star necklace, he began shouting anti-Semitic insults and punched the victim in the face. In August 2018, a Jewish restaurant and its owner were attacked by masked neo-Nazis in the town of Chemnitz. The attackers allegedly threw stones, bottles and a steel pipe at Uwe Dziuballa and shouted, Get out of Germany, you Jewish pig. German officials have taken a strong stand against anti-Semitism in recent years, reminding the country of it's repressed past and it's obligation to the Jewish people. German Chancellor Angela Merkel has been especially outspoken about her intolerance of anti-Semitism. On September 14, 2014, for example, she attended a rally against anti-Semitism in Berlin where she said, "I do not accept any kind of anti-Semitic message or attacks at all, not least the ones that were recently seen at the pro-Palestinian demonstrations." Today, Germany is one of the most reliable allies of the State of Israel. Limited diplomatic relations were established between the two states in 1956 and East Germany, as part of the Soviet bloc, was openly hostile. In 1965, relations between West Germany and Israel were fully normalized, even though the move led to the severance of relations between Germany and most Arab states. In the post-World War II era, Germany assisted the young state of Israel by providing infrastructure including roads, railways and public buildings. This also helped support German industries and helped the country bounce back after the war. When the first post-war German Chancellor, Konrad Adenauer met in New York City with Israel's first Prime Minister David Ben-Gurion on March 14 1960, it was an emotional and intense moment. After the meeting it was announced that Germany had authorized $75-100 million in loans to Israel, but David Ben-Gurion was met with harsh criticism from Jews around the globe. When the Berlin wall came down in 1989, Israelis held their breath, skeptical of the new unification and worried that a larger and more powerful Germany may not be as wary of its past. The unified German country has proven to be a valuable international ally and played a leading role in shaping the pro-Israel attitudes of many European countries. Germany has pursued a close relationship with Israel in the post-World War II era to regain legitimacy on the international stage and attempt to reconcile with Jews around the globe. This support for Israel crosses party lines in Germany. Germany has become one of Israel‛s largest trading partner in Europe ( in 2013 Israel imported $4.6 billion in German goods) and the source of its submarine fleet and other naval vessels and military hardware. In 2015, for example, Israel purchased four Corvette ships and four Patriot missile batteries. German Chancellor Angela Merkel became the first Chancellor to address the Knesset in 2008, causing five members of the Knesset to storm out of the room. It is believed that they were protesting the fact that German was being spoken by Merkel in the Knesset building. Political opinion polls show a divide between the government policy and the new generation of Germans coming of age. The German government officials base their political policy on the ties and events of the past, remembering the Holocaust vividly and basing their decisions on the strategic relationship shared with Israel and forged through this horror. The younger generation however wishes to take actions and make judgements about Israel based on the current situation and Israel’s policies. One effort to ensure younger generations see the Germany-Israel relationship as crucial to the well-being of both nations is increased Holocaust education in German schools. In 2013, Yad Vashem signed an agreement with education ministers from every German state that develops new and improved Holocaust education programs. Germany provided Israel with its fourth submarine in September 2014. The submarine was the first of the new generation of Dolphin submarines, with the capability of staying underwater significantly longer than the other three Dolphin-class submarines. A fifth German built submarine arrived in Israel on January 12, 2016. On April 3, 2016, Der Spiegel disclosed that the German Federal Intelligence Service (BND) had been spying on Israeli Prime Minister Netanyahu's office. The report also confirmed that the BND spied on the Interior Ministries of Austria and Belgium, the UK Defense Ministry, the U.S. State Department, NASA, and others. A $32 million collaborative project was announced in November 2016 by the Israeli Innovation Authority and the German Ministry of Science, which aims to advance the field of nanotechnology. The funding will allow nanotechnology institutes and incubators in both countries to collaborate on joint projects for at least three years. The German Parliament approved the purchase of 1,000 Israeli made and designed Spike LR anti-tank guided missiles (ATGMs) and 97 corresponding launcher units in March 2017. The contract, between the Bundeswehr (German military) and Rafael Advanced Defense Systems, is worth $172 million and is expected to be completed over 20 years. German President Frank-Walter Steinmeier paid his first Presidential visit to Israel during the first week of May 2017. He had previously visited Israel when he served as Germany's Foreign Minister. During his 2017 trip, he visited Yad Vashem, met with Israeli President Reuven Rivlin, and spoke with critics and proponents of Israel’s settlement policies. Speaking at Yad Vashem, Steinmeier remarked that we Germans have burdened ourselves with unfathomable guilt, and praised the close relationship that Israel and Germany have shared over the years. Germany sent planes to participate in the annual Blue Flag exercise for the first time in June 2017. The German pilots joined 70 planes from Israel, the United States, India, France, Italy, and Poland in the largest aerial training exercise to ever take place in Israel. The Social Democratic Party in the German Parliament blocked the lease of Heron TP drones from Israel in June 2017, citing the primary reason for their objection as the fact that the drones were capable of carrying weapons. Members of Parliament were quoted in German newspapers saying the deal was dead. The German Defense Minister announced that the German military had entered into an agreement to lease 3-5 Heron TP drones from Israel in 2016. The German military already uses the Heron TP's predecessor, the Heron 1, in Afghanistan. Leasing the drones was expected to cost the Germans $650 million, with the assumption that they would have been deployed in 2018. In early 2017, Israel Aerospace Industries (IAI) was awarded a $652 million contract to supply additional Heron drones. Israeli and German officials announced in late October 2017 the signing of a Memorandum of Understanding for the Israeli purchase of three additional Dolphin-class submarines from Germany. The German government signed $1 billion worth of arms deals with Israel in June 2018, including a $600 million agreement to lease multiple Israeli Heron TP military drones. Sources: Original article written by David Shyovitz. Frank Zeller, “Germany anti-Semitic offenses rise sharply in 2018, mostly from far-right,” Times of Israel, (February 13, 2019). Photo Credits: Worms Cemetery photo courtesy of Aaron Hertzman. Wedding and Hagadda illustrations courtesy of Alan Humm. Fragments photo courtesy of Juedisches Museum Worms. Mendelsohn’s grave, and Berlin monument photos courtesy of Philip Greenspun, www.photo.net. New Synagogue photo courtesy of David Navarro.